Both EF and Wall Street are very open and transparent about student numbers while TBI has long been secretive about them. There is a long history to this point. Back in 2009 when I first became Academic Team Leader at TBI Kuningan I was ordered by Chris Needham (the then school manager) never to tell student numbers to staff. In retrospect, the reasons for this were very clear. There were barely 100 students enrolled at TBI Fatmawati a year after Chris Needham had taken over. He had every reason to cover up his multiple failures in terms of student numbers. But the lack of transparency did not end when Needham was demoted. Until now TBI never posts student numbers on its website. This contrasts with EF, which freely announces that it has 30,000 students across its 65 schools in Indonesia. It also contrasts with Wall Street which proudly proclaims it had 8,000 students 6 years after opening. So while we have clear figures for Wall Street and EF, it is harder to get figures for TBI. (They have posted on their latest job ad on TEFL.com that they have had 50,000 students. Presumably that is over the past 29 years. Hardly a useful figure.) They seem reluctant to admit current numbers because they are so low, but based on interviews with multiple teachers at various branches, we say 6,500 is close to the mark. That was what they had in early 2012 and they have only lost schools since then. But I was in meetings where student numbers for all Group Schools were announced in late 2011, and we also know the approximate numbers for franchise schools at that point. In late 2011 there were about 6500 students at all TBI schools. (This included many dubious students at public schools in Bandung who are counted as students even thought they may only be paying a pittance each. More on this another time.) Since that time one TBI group school (TBI Malang) and 1 franchise school (TBI Semarang) have closed. Two others- Bekasi and Kelapa Gading- have low enrollments. Therefore, even if a couple of school have taken on 200 or 300 hundred new students (please provide us numbers if you have them! ), TBI is still floundering around 6500. They have clearly been overtaken by Wall Street and EF leaves them absolutely in the dust. 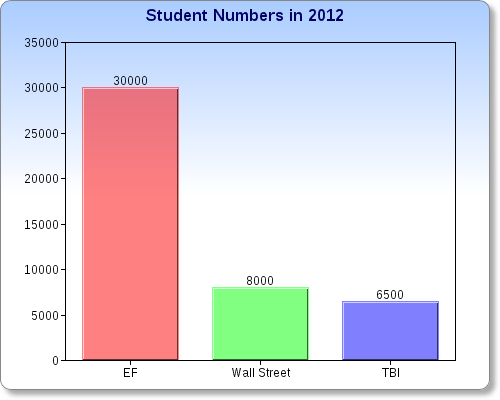 The following chart shows TBI languishing behind both EF ad Wall Street in student numbers. While the figure for TBI is only approximate, it is hard to believe they have added many students when two schools have closed and no new ones have opened. How Do We Know About TBI’s Competitors? Why Hasn’t TBI Gone Bankrupt?